Hirado was an important kiln in the history of Japanese ceramics and its widely varied wares rank among the finest made, and are still considered by many as the finest in the world. The body of both bowl and lid, of the finest white porcelain, are decorated with panels depicting a landscape scene, a scholar, and a bird within foliage. About Ryonyu(1756-1834). He is the 9th generation of the great potter Kichizaemon Raku. MAKER : There is the signature of Raku of Ryonyu. This is made well and is a very good style of the work. And this is a very good old atmosphere. 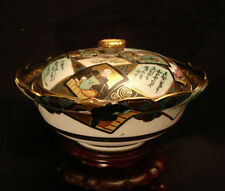 Good taste Japanese old Imari multitiered bowl w/box. This multitiered bowl is made of tasteful Blue & White Porcelan. Material/ Porcelain & Pottery. It has good old atmosphere. This item appears to be about 120-150years old. Used by only very high rank the Daimyo, busho. Raden & Gold lacquerware. / Japanese lacquer, gold leaf on wood. Raden (mother-of-pearl inlay work). choshi is originally a vessel with a long handle used in a Shinto-style wedding ceremony. We have collected the all kind of Japanese antiques. Color / White. We are happy to understand you the matter. The item has a Wooden box. Condition : Good. Also to get proper amount of compensation in case of item breakage. We have collected the all kind of Japanese antiques. The item has a signed box. Color / Green. We are happy to understand you the matter. Also to get proper amount of compensation in case of item breakage. This is an antique Japanese Edo Era (c. 1850's) hand thrown ceramic lidded bowl in white and blue with a crackle glaze. The design is of the three friends of winter. Plum blossoms, pine trees and bamboo together symbolizes steadfastness, perseverance and resilience as they do not wither in winter. We are happy to understand you the matter. We will make every attempt possible to resolve the issue if we made a mistake. If there is a problem, we can work together to resolve the problem. Also to get proper amount of compensation in case of item breakage. We have collected the all kind of Japanese antiques. Landscape Flower pattern. Blue and White ceramics. Worst two months. Color / Blue. porcelain characterized by a blue glaze. We are happy to understand you the matter. We are happy to understand you the matter. We have collected the all kind of Japanese antiques. Worst two months. We will make every attempt possible to resolve the issue if we made a mistake. If there is a problem, we can work together to resolve the problem. We are happy to understand you the matter. We have collected the all kind of Japanese antiques. The item has a signed box. Color / Brown. Worst two months. Also to get proper amount of compensation in case of item breakage. We are happy to understand you the matter. We have collected the all kind of Japanese antiques. Color / Gold. We will make every attempt possible to resolve the issue if we made a mistake. Worst two months. Color / Blue. We are happy to understand you the matter. We have collected the all kind of Japanese antiques. Even though it happens rarely, we do make mistakes on occasion. Also to get proper amount of compensation in case of item breakage. We have collected the all kind of Japanese antiques. Color / Green. Worst two months. We are happy to understand you the matter. The item has a Wooden box. We will make every attempt possible to resolve the issue if we made a mistake. Worst two months. The item has a Wooden box. We are happy to understand you the matter. We will make every attempt possible to resolve the issue if we made a mistake. We have collected the all kind of Japanese antiques. This Bizen ware tea cup has very nice carving of Japanese poetry. This item appears to be 40-50years old. We have collected the all kind of Japanese antiques. Color / Gray. The item has a signed box. We are happy to understand you the matter. Condition : Good. Also to get proper amount of compensation in case of item breakage. Blue and White ceramics. porcelain characterized by a blue glaze. We have collected the all kind of Japanese antiques. Worst two months. Color / White. We are happy to understand you the matter. Condition : Good. We have collected the all kind of Japanese antiques. Color / Brown. Worst two months. We are happy to understand you the matter. We will make every attempt possible to resolve the issue if we made a mistake. It was made in Nagasaki near Karatsu more than 270 years ago in the early Edo period. Primary Material Pottery. In case of SAL, the weight of a parcel cannot exceed 2 KGS. Age 1700-1750. Storage Box None. SHINO ware is one of MINO ware. SHINO’s Feature is White Glaze over Scarlet. 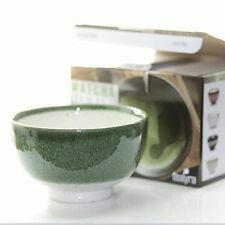 This item is MINO ware Tea Bowl for Serving Tea. MINO ware is the pottery of GIFU prefecture in Japan. We started to send by SAL. We are happy to understand you the matter. We have collected the all kind of Japanese antiques. Worst two months. Color / Blue. We will make every attempt possible to resolve the issue if we made a mistake. The Ninth Raku - Ryonyu (1756-1834). The second son of the Seventh. Known as a "master of the likes of the Third," the ingenious forms created with a spatula are characteristic of his works. In 1825, he retired to Omikoku Ishiyama, and led a life of leisure with dignity. We have collected the all kind of Japanese antiques. The item has a signed box. We are happy to understand you the matter. We will make every attempt possible to resolve the issue if we made a mistake. 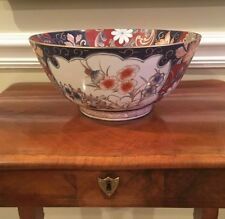 F194: Japanese bowl of old KUTANI porcelain ware with very good painting. MAKER : There is the signature of KUTANI. This is made very well and is the very good painting work. Of course, this is hand-drawn work. The painting work, use of color are appropriate old KUTANI-yaki. We have collected the all kind of Japanese antiques. Color / Brown. We are happy to understand you the matter. The item has a Wooden box. Also to get proper amount of compensation in case of item breakage. Used by only very high rank the Daimyo, busho. Gold lacquerware. / Japanese lacquer, gold leaf on wood. _ Edo era. samurai art _. Material: Japanese lacquer, gold leaf on wood. Other : Not box. I can send all over the world. Tea Ceremony Chawan Minatohon-kiln Red TeaBowl. by 15th Kichizaemon Tsushio Raku. Pre-owned, almost no signs of use. Pre-owned, minimal signs of use. Pre-owned, heavy signs of use. I participate from Japan. The deep, slightly everted sides are an unusual form. The outside is sparsely painted with prunus and pine. The well is an underglaze blue varying in color from deep indigo to grayp-blue. There is an old gold repair that really adds to the overall beauty and uniqueness of this piece. We have collected the all kind of Japanese antiques. The item has a signed box. Color / Black. We are happy to understand you the matter. Also to get proper amount of compensation in case of item breakage. 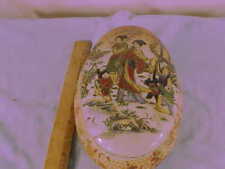 BOWL HEIGHT WITH STAND 7.5CM. Nice Imari bowl, figures, Japan, late 19th century. Our goal is for your buying experience to be a pleasure. This Karatsu bowl was found in Tokyo's largest antique festival this month this month. The size is the size between Chawan and Choko. I felt it was an affordable size that could be used for both sake and tea time. It is a very unusual size. Very elaborate Kin Naoshi (repair with gold powder) is given. Nimble straw glaze (warabai yuu), Tokin koudai is due to korean pottery influence. (the pointed part of koudai) I feel charm in an innocent expression unique to early Karatsu yaki. 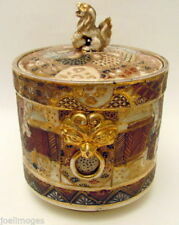 16th c END (Momoyama) SIZE(about) 11cm×5cm (4.33inch×1.96inch) Total weight: 164g Condition:used / There is a part repaired by gold. Seto is one of the Japanese Six Ancient Kilns. Its history is very old. Origin is a 12 century. It is origin of current Japanese pottery. So the Japanese ceramics in general are referred to as Seto-mono. We have collected the all kind of Japanese antiques. Worst two months. We are happy to understand you the matter. Color / Blue. We will make every attempt possible to resolve the issue if we made a mistake.